Love That Max : Giveaway: I've got cupcakes, people! A couple of months ago, while I was at BlogHer and hanging in the Serenity Suite, I tried THE most delicious cupcake I'd ever had. And I've had me some cupcakes. It was lemon, with coconut cream-cheese frosting and a sprinkling of coconut, by LuxSugar. Sweet but not too sweet, with a tasty, moist cake base (I usually toss less-than-exciting cupcake bottoms). I have been thinking/dreaming about that cupcake ever since. The sweet people of LuxSugar are offering up a box of cupcakes to two of you. Each box will contain 12 cupcakes; you get to pick two flavors from their delish list and they'll send 'em off to anywhere in the United States, shipping and handling included. Approximate value of each box: $60. Enjoyment: priceless. To enter, check out the flavors and say which two you'd prefer. • Share one of the cupcakes with me. Kid-ding! This giveaway is open until November 10, 11:59 p.m. EST, and is only for U.S. residents (with a sweet tooth). I'll randomly pick two winners, announce it on this post and alert you by email. If your email is not visible on your blog, definitely mention it in your comment. And the winners are... Jennie B (who would like the Samantha and the Pacino) and Lauren H (who wants to try The Rick James, Samantha, George C or the Seinfeld). Enjoy! yummm... The Rick James. Chocolate & mint~can't go wrong with that! Mmmm. David B and Seinfeld for me! Marilyn Monroe and Prince Harry all the way baby! mmmmmmm, Cupcakes!! I think the Marilyn Monroe and Pacino flavors so AMAZING! I would get the Green Tea and the Seinfeld. Oh my, they all look yummy but I would love the Perez Hilton & Kanye W.
YUM! Can never go wrong with lemon, so definitely the Samantha! And C. Rock! I like the Samantha lemon cake with lemon vodka frosting...yummy carrot cake and cream cheese frosting too....yummy..wait I see more I like! I really want some of those Sandy B's, it says it's just a summer flavor though....if not I'll gladly try some Prince Harrys. YUM! Oh wow! I've never heard of Lux Cupcakes as we don't have anything like that here in Arkansas! There's so many great flavors to choose from. I'd love to try the Marilyn Monroe and the George C.
If I win you can email me at Lukin4spcialsum1@aol.com Thank you!!! I would pick Marilyn Monroe and Perez Hilton. Yum! My picks would be Seinfeld and Samantha. Rick James and Kayne W please! green tea and prince harry, yum! I'll take Kanwe W and Prince Harry! Yum! Yum-o! I would prefer the Perez Hilton and Samantha! Oh, and it's shannon dingle [at] gmail [dot] com, minus all the spaces. OMG. These flavors sound amazing! I'd love to try Marilyn & Denzel. The George C and David B sound perfect for our family. Audrey Hepburn and Betty Paige! All the flavors sound amazing, but who can resist pb&j in cupcake form - fun!! The prince harry also sounds really good. YUMMM! PB&J and the C.Rock for me pleaze! Oooh yummy! Fifty cents or Denzel for me! Gotta have chocolate! Oh, Kanye W & Prince Harry! follow you on fb of course! I would choose the David B and the Fifty cents cupcakes. The David B looks pretty delicious to me!!! Marilyn Monroe and David B! Yum-O! Ohh, the David B and the George C. How yummy the all sound. These sound DELISH! Prince Harry and Denzel for me! I'd pick the Marilyn Monroe and the David B. Yum! Mmm. Kanye and David B. And love your blog, here and on FB! I follow LuxSugar on twitter @Aerated. I'd love to try the David B. and the Prince Harry. 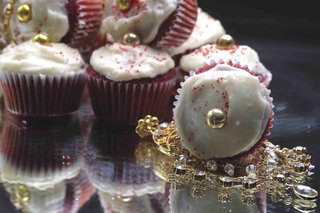 MMMMM I think we would pick the Marilyn Monroa and the Rick James cupcakes! I "like" Love That Max on Facebook! I'm all for the Rick James - chocolate and mint is to die for in my book! Absolute heaven! I'd pick Betty Paige and Prince Harry. They all sound wonderful! Thanks. I like Love That Max on Facebook. It seems so odd to put this in writing but I would have to say Perez Hilton and C. Rock for me!!! I would love the Marilyn Monroe and the David B. Yum! I'd love Marilyn Monroe and Rick James. Drool. The Marilyn Monroe and Kanye W. The pic of the Monroe red velvet makes me want to dive right thru my computer screen & hubby & daughter would love the chocolate cupcakes! I like the Denzel and the Marilyn Monroe. Audrey Hepburn and Kanye please! Betsy0040 @ aol.com and I follow you on Facebook as well! I can't name one person in the world who doesn't like a good cupcake. Just reading the list makes me want to eat them all haha. If I had to pick just two, I'd say the Audrey Hepburn and the Seinfeld. My boyfriend hates chocolate so the Audrey Hepburn would be perfect for him. The Seinfeld looks me in the face and screams eat me because I am a coffee addict and adore all things coffee flavored. I am following on FB (Erin Lee). My picks would have to be Marilyn Monore and Bettie Page cupcakes. I'm a sucker for peanut butter so I'd choose PB&J and I also love coffee and vanilla so I'd choose Seinfeld. But I'd also want to pick Rick James to see what that looks like because you KNOW it would be wild. Following you and LuxSugar as @sarahunsicker. Denzel and Samantha for my other half, who might actually get one. As we say in my house, 'thank you for sharing"
oh, the marilyn monroe for sure b/c i loooove red velvet! hard choice for the second but i think i'd want to try out the PB&J! Only two???? Then I'm going to have to go with David B and Prince Harry. Ohhh, cupcakes! I could definitely go for an Audrey Hepburn or a Marilyn Monroe. I would like to try the Kanye W and Audrey Hepburn. I would pick Fifty Cents and Samantha. Argh. Definitely the Kanye and the Marilyn Monroe. And I SO would not share. With anyone. I pick David B - Caramel cake w/ english toffee frosting and the Pacino- Coffee flavored cake w/ chocolate buttercream frosting. Hard choice though. Can I haave one of each? 50 cents and prince harry. reading all of their creations made me so hungry! I like the David B & Samantha cupcakes! Rick James and C. Rock both sound delicious! We can always use more cupcakes! Pacino and Samantha! I think- I may change my mind, or take my boyfriend's preference under consideration..he would pick the chocolate mint! I'd luv these two flavors, Kanye W - Chocolate cake w/ chocolate ganache frosting & Betty Paige - Chocolate cake w/ vanilla frosting. Yummy! Prince Harry (as long as he has no nuts!-ok, that didn't really sound quite right) and Samantha would be my top choices. follow Love That Max on twitter as sherri2345. Oh yum! I would love to try the Samantha and the Prince Harry or any of the others! David B - Caramel cake w/ english toffee frosting and PB&J- Vanilla cake w/ strawberry jelly filling & peanut butter frosting. They all sound good. I'd have to go with the Kanye W and the Samantha. They all look great but if I have to pick two they would be the Audrey Hepburn and the David B cupcakes. Marilyn Monroe and Kanye. They all sound so good though! definitely tough to pick a pair - but since i have to : Prince Harry - Carrot cake w/ cream cheese frosting and Audrey Hepburn - Vanilla bean cake w/ vanilla frosting (for my son who likes white food! ); I've signed up for both twitters, liked on facebook; Thanks... love the fun stuff. Definitely Marilyn Monroe...well, it's Marilyn Monroe and we had these red cake for our wedding cake! Id like the Rick James and Marilyn Monroe. I'd go with PBJ & Pacino! Oh, they all sound delicious!! I'd pick the Green tea and the Seinfeld! Marilyn Monroe and Samantha for me please! Kanye and Seinfield. Love the names!!! Does the answer "all of the above" count?!? OMG they look Fabulous! If I had to pick 2...maybe the Seinfeld, and PB&J ? and I follow you through google reader! twitter follower of luxsugar too @icitea. Rick James and Seinfeld. These cupcakes look so good I'm tempted to spend the money just to try them. Email: piper_466@hotmail.com! Thanks so much for sharing your stories and offering delicious treats as prizes! I would love the Audrey Hepburn and the The Diddy! I would choose Prince Harry and Denzel. The David B or the Prince Harry! Even the Perez Hilton looks good. I can't decide. I would chose the Marilyn Monroe and Prince Harry. Wow. The Rick James, Samantha, or George C. Or the Seinfeld. Wow. TASTY. yummmm.